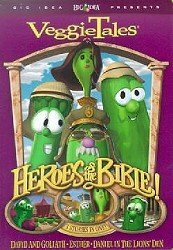 In "Daniel and the lion's den," Larry the Cucumber (as Daniel) finds himself in deep trouble thanks to the King's conniving wisemen, played by a trio of slippery scallions. In an exciting finish, Daniel learns that even in the lion's den, he is still in God's hands. In "Dave and the giant pickle," Junior Asparagus (as David) is pitted against a really mean, really big pickle! In the end, little Dave learns that it makes no difference whether you're 9-feet tall or 2-feet tall-- with God's help, even little guys can do big things. In "Esther, the girl who became queen," a small-town girl wakes up with the weight of the world on her sholders and the fate of her people in her hands. Can she find the courage to do what's right? Heroes of the Bible Includes stories of David and Goliath, Esther, and Daniel in the Lion's Den.